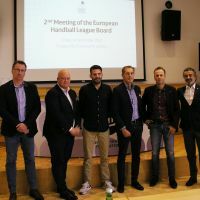 Following its foundation at the inaugural general assembly of the European Handball Leagues (EHL) in June, its board held the first working meeting at the EHF headquarters in Vienna. Although the first important decisions of the new body in terms of strategies are yet to be taken at the next meetings, its inaugural session has outlined the future plan in a positive atmosphere and served as a platform for an exchange of information. In his welcome words, Michael Wiederer, the EHF President reiterated the importance of having the EHLB on the same schedule as the other stakeholder groups prior to the meetings of the EHF Executive Committee. The EHLB chairman Nikolas Larsson together with the vice chairman Frank Bohmann will also represent the EHLB in the Professional Handball Board. Among many various topics discussed at the meeting, the countries with active/non-active leagues (regardless of size) were distributed among the EHLB members; meaning that the leagues of Europe now have a direct contact person within the EHLB. The EHLB will actively move forward in discovering the key issues among its members.